– Social psychologist, Amy Cuddy. When I first heard Amy Cuddy’s TED talk about the way body language shapes us, I immediately related it to my prayer. In Islam, the prayer is both a physical act and a spiritual experience. Have you ever seen a Muslim pray? 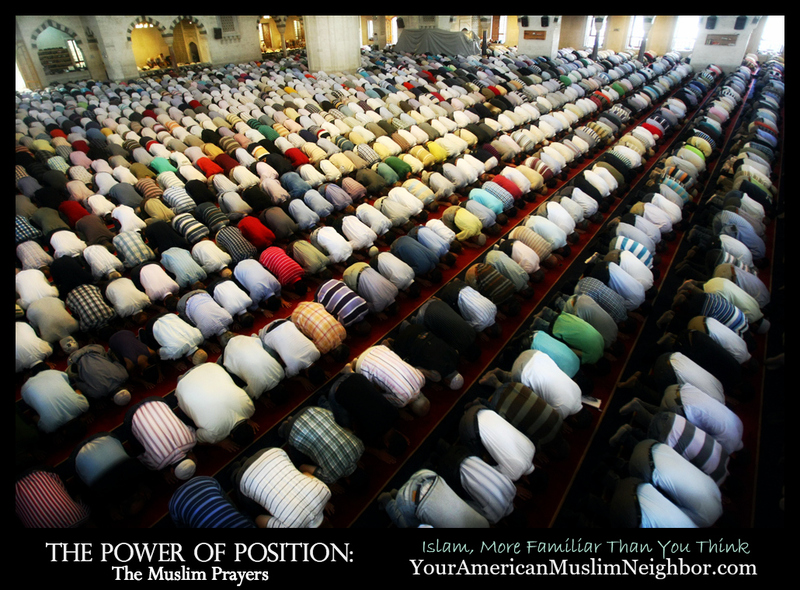 The english word ‘pray’ can refer to almost everything we Muslims do, but the specific prayer I am referring to is the one where we stand, bow, and prostrate. It’s called Salah. When I lived in Brooklyn, I lived right next to a building inhabited purely by Hasidic Jews. I remember walking home at night and occasionally seeing one of them near a window rocking rhythmically, his curls whipping back and forth. I assumed it was some sort of prayer ritual. At that time, when I was still up on my pedestal of intellectual superiority over religious adherents, I found it quite ridiculous. I wonder sometimes, what people think when they see Muslims performing the salah. Does it look like a vacant ritual? The salah is one of the most crucial aspects of one’s faith and practice of Islam. Abandoning it literally takes a person out of the fold of Islam. So how could standing, bowing and prostrating be so important? When we perform the salah, we are indeed communicating with our Maker. How well we are attentive to what we are saying decides how beneficial the prayer will be. Internally, it is a meditation, but what about the physical movements? According to recent studies, holding particular body positions can impact our psyche and attitude. The positions of the body actually influence the person performing them – subconsciously. Holding a position of strength and power, such as standing tall with your fists on your hips for about 90 seconds, will actually make you feel more powerful and confident, perhaps capable of achievements you might otherwise shy away from. The research and explanation which Amy Cuddy presented at TED (find the link to her talk below) really is the best way to explain what Muslims are doing physically, when we perform our prayers, in a way that helps bring the salah into the realm of the familiar – at least at the superficial level. and that we would put the uppermost part of our bodies, the most honored part – our heads – on the ground; as low as possible, when we glorify God and acknowledge His total Supremacy. Sometimes our minds wander, the positions also help bring our consciousness back to our words. Fortitude and humility are qualities critical for every Muslim. We have to be firm and grounded, focussed. We have to be humble, in relation to other people, but especially in regard to our Maker. One of the greatest pitfalls of life, according to Islam, is arrogance; feeling self sufficient and greater than we really are. Islam has many levels, from the superficial to the very deep, from the physical, to the spiritual. Some parts are followed by others. Some aspects are like foundations, upon which the rest is built, without which, the structure is weak. Others are there, almost like reinforcements and safety nets. The physical aspect of the salah ensures that the worshipper walks away with at least a little bit of humility, even if only induced by deliberately physically humbling themselves. So do the positions of salah influence our state of mind? The most sure, undeniable thing about my life, is that I am going to experience death. It could be today, in a week… anytime really. My hands will no longer touch the skin of my children, their hair. My eyes will cease to gaze at the breathtaking sky and my shoulders will no more feel the pleasure of embrace. My life is only a road leading to that destination. That inevitable moment where my body will become just an empty vessel that will be consumed by the earth. Before my Islam, this realization was difficult to endure. I realized I could leave my home to go somewhere and never arrive, or never return; that I could begin crossing the street and be smashed by a car; that virtually at any moment- my life could simply end… and that’s true for all of us. The fragility of life begs many questions doesn’t it? Do you ever wonder; Why? I am a Mother. My husband and I have five adorable and sweet, little children. But she too will have to die… my baby. Doesn’t that make you think? But they too are only traveling towards their deaths. Of course it does, it should. But the actual reason we are here; that we have been given life. We say goodbye to our friends and coworkers as if we will definitely see them tomorrow. We look at our treasured children and forget that their lives are finite. We should be preparing them not just for college and marriage – but for true success and we can only do that if we are preparing ourselves. We can only do that if we have sure knowledge and clear guidance. Yet, your greatest purpose is to have fun and enjoy it? Or to love and be kind? How is loving people or being kind to people who are also going to die, an integral purpose? The fact that these things are not completely satisfying should propel us further – one shouldn’t rest, until they are sure they’ve found the truth. Not blind faith, or something that makes you feel better. And there cannot be multiple truths about our existence. Then, upon finding the truth one must pursue knowledge and practice of it – that is by necessity. Life is not a mystery left for us to wonder about for it’s extent. If you are someone who is truly seeking the truth and you are fully willing to submit to it once you discover it, then ask the One who created you for help, and He will surely guide you to it. I know why I am here. I know why we are here, how we got here and where we are going. I only know this because the One who created all of it provided us that information. I don’t ignore death or try to forget about it. I remember it often – the destroyer of life’s pleasures. It’s not to be macabre or morbid, but as motivation to do good and avoid being lazy. Because that is how we keep from being distracted by life from our true purpose. So we don’t get lost in pleasure and family and tasks and responsibilities. Or even sadness, depression or anxiety. Death is not the calamity, but the hardening of our hearts and the denial of the One who gave us life, that is the real misfortune. So we remember life is short and can end at any moment, thus we better use it wisely and stay focussed on the goal – our ultimate reality. My fear of death itself is replaced with concern for the manner in which I return to my Maker. Will I be one with whom, He is pleased? Or will I die wronging myself and denying Him? I can’t avert my death, but I can strive to return to my Lord in a good state – fulfilling the purpose for which I was created. I can strive for the real life, that isn’t fraught with difficulty and displeasure, but filled with peace. So while I am closer to my death with every breath I take, I try to also be closer to the One who owns everything, is of extreme Mercy and Who can grant me eternal life. Do you not see that (The One God) has made subject to you whatever is in the heavens and whatever is in the earth and amply bestowed upon you His favors, [both] apparent and unapparent? But of the people is he who disputes about (God) without knowledge or guidance or an enlightening Book [from Him]. And when it is said to them, “Follow what (God) has revealed,” they say, “Rather, we will follow that upon which we found our fathers.” Even if Satan was inviting them to the punishment of the Blaze? And whoever submits his face to (God) while he is a doer of good – then he has grasped the most trustworthy handhold. And to (God) will be the outcome of [all] matters.